Kittens should gain weight every day. Mama cats get a bad rap sometimes, because they may show signs of disinterest in or neglect of their kittens. While some queens really are just bad moms, you can't always blame them for not properly feeding their young. In the wild, a queen is liable to lose most of her litter to health problems or predators, so some level of detachment is instinctive. If a kitten doesn't do his own part to claim a spot at feeding time, he may get left behind. 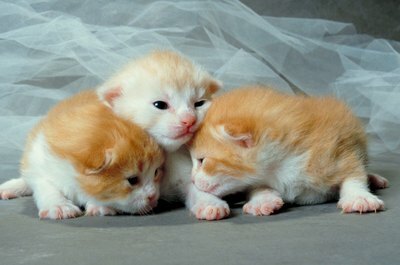 In nature, the mother would have to just cut her losses and let the kitten perish. The signs of malnutrition in a kitten are glaring, so if you pay even a little attention, they'll stand out. First of all, watch the babies at mealtime. A malnourished kitten probably won't show much effort in feeding himself. Kittens should gain weight every day, so a kitten who looks lighter or is actively losing weight is almost certainly malnourished. A much easier symptom to notice is the crying -- a hungry kitten will meow and cry constantly, until his malnourishment is such that he doesn't even have the energy to cry out anymore. If your kitten isn't feeding himself, it's your responsibility to take on the role of the mother. He needs to get adequate nutrition, or else he'll not only not grow -- he may die. The feeding schedule of a newborn changes quickly, so consult your veterinarian for her recommendation. For example, for the first four days of life, a kitten needs to be fed about once every four hours, while after just a few weeks, he should only be eating three times a day. That cow milk from the fridge won't cut it, either -- kittens have very fragile constitutions, and need special formula that will deliver all the right nutrients without upsetting any tummies. When he is between 4 and 10 weeks old, your kitten can stop getting his nutrients from a bottle and can start eating out of a dish instead. The weaning process varies from kitten to kitten -- some may take to it like a natural, while others need a little time to adjust. The important thing is to make the transition gradually, because if you just cut your kitten off of his liquid diet, he may resist eating solid foods and start losing out on vital nutrients. Keep careful track of how much he eats every day to ensure that he's getting the nutrients he needs. Hartz: What's Wrong With My Kitten? Does It Do Any Good to Treat Outside Pets for Fleas & Ticks?